Over the weekend, Nebraska hosted it’s second junior day event. It was a bit more low-key than the first one, but there were still some important visitors on campus. Junior day also happened to fall on the same day as what ended up being "former players day" as about 100 former Huskers were on hand to take in a spring practice. >>Last month, 3-star defensive end (HV Rating: 86.3) Mosai Newsom‍ made a surprise mid-week visit to Nebraska. 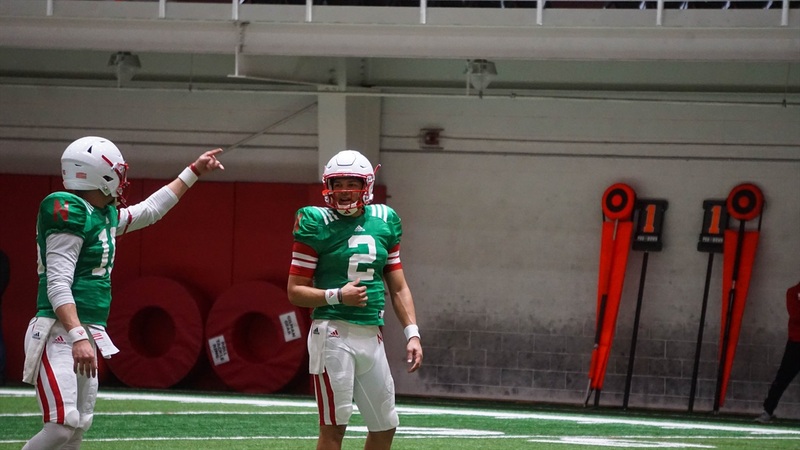 On Saturday, I saw he and his dad being walked out of the facility by defensive coordinator Erik Chinander, so he made a second trip back to Lincoln to check out a practice this time. I’m scheduled to speak with Newsom tonight after his track practice, so I will have more then, but he would be great coup from Iowa. Generally the Hawkeyes do a great job of keeping in-state talent home and he is a perfect 3-4 defensive end in Chinander’s scheme. >>Speaking of surprise visits, 3-star quarterback (HV Rating: 87.5) Luke McCaffrey‍ was a late addition to the weekend visitors. The Highlands Ranch, Colorado, prospect will become the full-time starter at his school this year, as he sat behind a quarterback that went to Colorado last cycle, and his brother, Dylan, currently a sophomore at Michigan. He’s raw as a prospect, but he wants to play quarterback in college and with the depth Nebraska has it can take a developmental quarterback this year if it chooses to go that route. >>Last weekend, Nebraska hosted two of its top running back prospects in Breece Hall‍ from Wichita, Kansas, and 3-star (HV Rating: 82.8) Thomas Grayson‍ from Tulsa, Oklahoma. Both are probably rated too low, so expect a ratings bump during their senior seasons. Two weeks ago, Nebraska hosted their top running back target, 3-star (HV Rating: 88.4) Rahmir Johnson‍. The Huskers will likely take at least two running backs this cycle and if they all happen to be in the group that has visited so far, it would be a nice haul as they all complement each other well. >>It can’t be said enough what an impact it can have on recruits and their families to see more than 100 former players come back for a spring practice. As someone who covers the team it may be old hat or fans may come to expect those types of shows of support, but it never fails to impress those who haven’t seen it before. A large part of the pitch that this coaching staff uses is that Nebraska football is a lifetime brotherhood, that the connections you make with your teammates and the state last well beyond the four or five years that you run out onto the field at Memorial Stadium. So when you get to actually show that instead of just saying it, it can produce powerful quotes like this one from 3-star wide receiver (HV rating: 83.2) Desmond Hutson‍,‍ who was in Lincoln on Saturday. “For over 100 people to come watch a practice shows that Nebraska really has something special going on," Hutson said. "That someone would take time out of their day from all across the world to watch a practice, it really shows it’s a brotherhood at Nebraska. It’s a lot of love and it’s something you can carry for the rest of your life. It’s not just about football, it’s about relationships.